Note: While this illustration is probably still under copyright, I believe that this display falls under fair use, and is not a copyright violation. Of course, given the current state of copyright law in America, it's really anybody's guess. Second note: In case it is not obvious, there is no connection between this website and Del Rey, the publisher of the book pictured above. The Del Rey people seem pretty cool, and they publish a number of great books, but my only connection with them is that I buy a book from time to time. The term panthan comes from the Martian Tales of Edgar Rice Burroughs (slightly better known, perhaps, as the creator of Tarzan). In 1911, the first book written by Burroughs appeared. It was A Princess of Mars, the first of the eleven books that chronicle the adventures of John Carter, who becomes (in the third book), the Warlord of Mars. Panthans on Mars are wandering warriors. These are men who for any of several reasons have had to leave their home cities, and therefore survive by hiring their swords. There is none of the negative connotation of the modern term "mercenary"; it is understood that panthans are in general honorable soldiers who have left home for many reasons, few of them having to do with shame. This is the vanity domain of Chichka. In the Martian Tales, the local name for Mars is Barsoom (the Earth is called Jasoom). While I am enough of a fan of the Tales to have read them all, and some of them several times, I am not the person to create the definitive ERB or Martian Tales web page. Instead, I offer these links to some pages that others have created. The Edgar Rice Burroughs, Inc. web page is here. 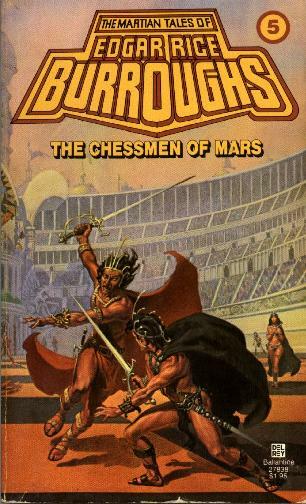 The version of chess played on Barsoom is called Jetan (it is played with captives, who are forced to fight to the death to take squares, in the book pictured above). The rules of Jetan are available here. A link to a bunch of other ERB pages is here. This page hosted at LunarPages.